Homemade toys children often enjoy more than the purchase. 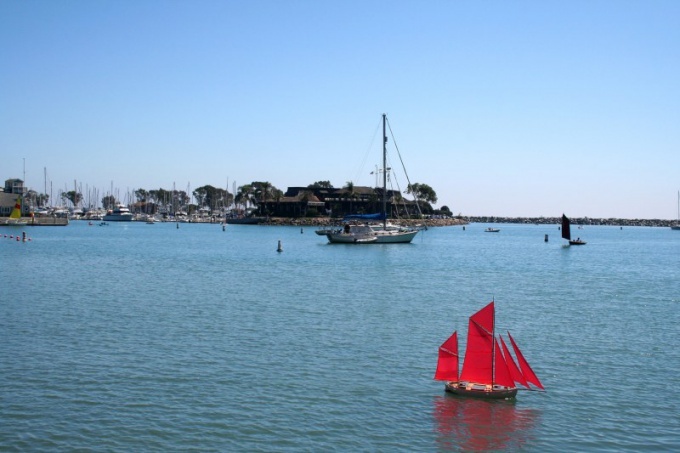 Wooden boat - a traditional pastime, is popular with many generations of children. This boat held up fine on the water, it can be put in the tub, a pond, a Creek and even in the sea. Draw on the Board the ship hull. For flat-bottomed vessel, measure a length of 15 cm and a maximum width of 6-8. The sailboat should be wide enough, it will provide him stability. Saw out the contour of a rectangle. Divide the short side in half and slide longitudinal axis. Determine where your boat will nose. Back away from the edge along the long sides 5 cm and make a mark. Connect them to the middle of the nearest short side. Nasal corner Express sharp, and the cheekbones better rounded. This will provide the desired flow. From the stern back on the sides 3-5 cm Connect the resulting points with a smooth curve, convex part of which is directed backwards. Make sure that the stern line was symmetrical. Saw out with a jigsaw, the hull on the drawn contours. Aft along the longitudinal axis to make a jigsaw propyl length 1 see Here will be attached to the wheel. Decide how many masts will have your boat. It is possible to do with one mast or two-mast. From single-masted sailboat along the longitudinal axis at a distance of 7 cm from the nose mark. If you want to make 2 mast, make a mark at a distance of 6 cm and 11 cm from the nose. Using a knife in these places, decks, make a short longitudinal incisions. Each rail with one end sharpened in the form of flat blades so that it is inserted into these incisions. The rudder was fabricated from the wafer, cleaved with a knife scraps from the same boards from which you were cut body. The wheel should not be too large. Its length is about 3 cm Paste it into propyl. It must be tight and protrude below the hull by about 2 cm. Optionally, secure the wheel with glue. Cut out sails from paper. In this case, they represent the rectangles. The width of the sail must not exceed the width of the building. On one mast can be 1 or 2 sails, the upper smaller than the lower. 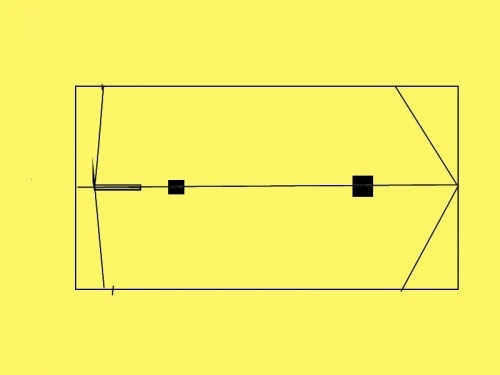 Make the rectangles in the 2 hole. Put sails on the mast. Insert the mast sharp ends into the slots of the deck. For durability they can also be secured with glue. Secure stud on the nose end of the twine. Route it along the tops of the masts so that the slats rested on thread. The other end fasten a nail on the stern. Put the ship on the water and see sustainable or not. If the ship is unstable, shorten the mast. This is usually not required. After the test, remove the sailboat from the water. Let it dry and paint with oil paint. The mast painting is not required. For sails, you can use colored paper. They must be light, so paper is better to take thin. If the tops of the masts of the thread does not strengthen, but simply to pull her sails can be changed. 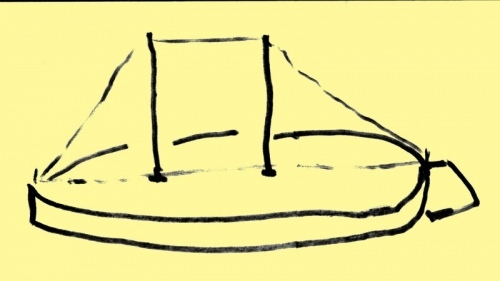 The sails of the boat of this design can be rotated. This will allow the boat to go at an angle to the wind.